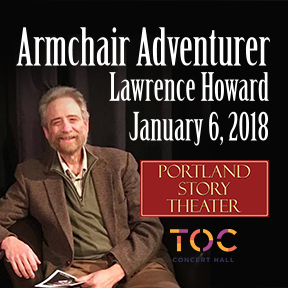 Portland Story Theater is excited to announce that in 2018, Lawrence Howard will retell the amazing story, Polar Opposites Amundsen, Scott, and the Race for the Pole. Third in the Armchair Adventurer series, Howard first told this story in 2011 on the 100 year anniversary. Polar Opposites recounts heroic and tragic events in Antarctica one hundred years ago. Scott and his four companions fought their way to the Pole only to find the Norwegian flag flying there: Amundsen had beaten him by five weeks. Crushed by disappointment, utterly exhausted and short on food and fuel, Scott and his companions froze and starved to death on the return journey, just eleven miles from a huge cache of provisions and supplies. This a tale of the agony and the ecstasy, of accomplishment and failure, of a glorious victory overshadowed by an even more glorious defeat. Launched in 2008, the Armchair Adventurer Series chronicles true, historical events with the energy and emotion of a personal narrative. From the deadly, frozen landscape of Antarctica to the merciless abyss of the sea, Armchair Adventurer journeys through the most heart-wrenching survival tales of all time. These are epic stories of great adventure, perseverance, and courage, created and told by Lawrence Howard. NOTE: This show only 17+ ok if accompanied by guardian. Listener Discretion Advised.